Sometimes, a product comes along that’s just such a great idea, you wonder how you managed without it. And for anyone who uses hair extensions, I think I’ve just found one! Most people are a bit surprised when they find out I wear clip in extensions regularly, mainly because I like them to look subtle. If you don’t know I have them in, that’s the goal! I have several different sets, and a couple are purely for volume – they’re the same length as my real hair. 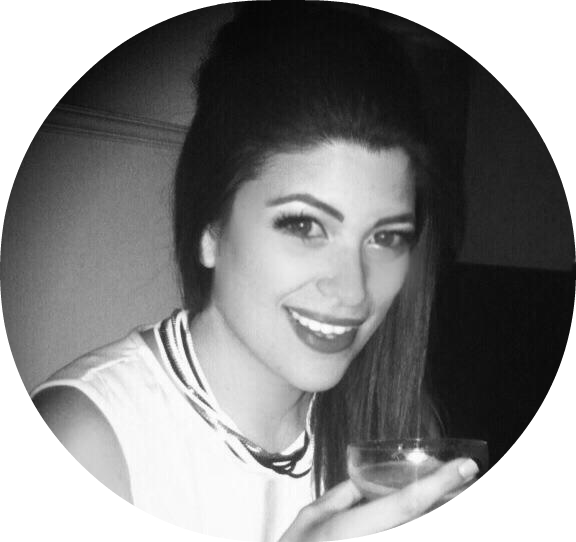 I also wore very natural clip-in extensions on my wedding day, because I wore my hair in a half-up half-down style with a beehive and plaited sections, and I wanted to have enough hair to do all that and not have the bit that was left down look too thin and scraggly. As a busy working mum, with very little time or patience for hair styling, it’s a massive advantage to me if I can pre-style some extensions, clip them in and go. 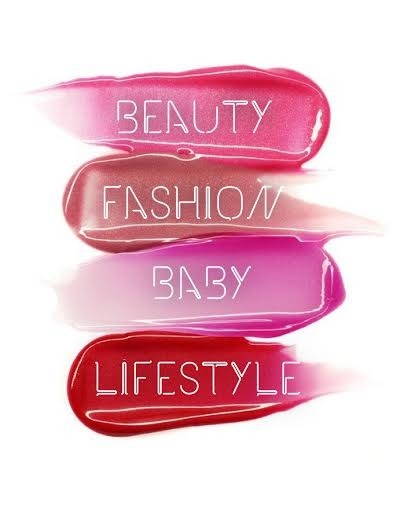 But washing, styling and caring for extensions can be a fiddly job. Luckily, Easiweft has now arrived to help take care of those problems! The logic is all there. A good set of hair extensions can be an investment. Generally, you get what you pay for. And if you’ve paid out, it only makes sense to take the best care of them, as they will last longer and look better. Now, I don’t know if you’ve ever tried to wash hair extensions but it can be a total nightmare. You end up with lots of damp wefts draped all over the bathroom, and I know a lot of people who won’t even bother washing them because it’s a hassle. 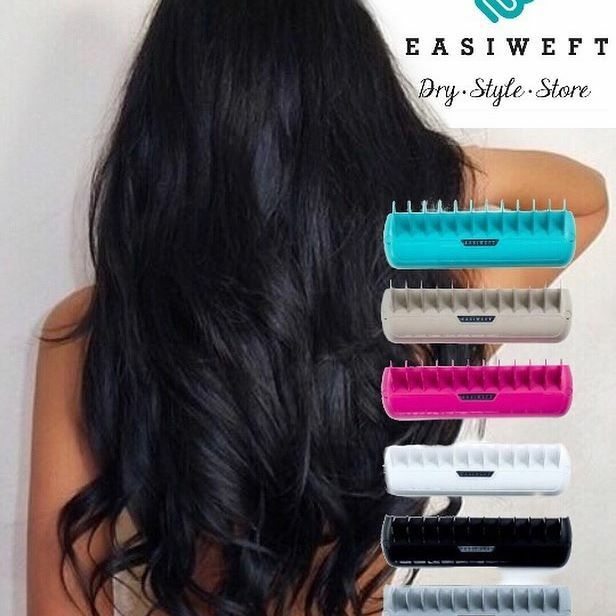 Easiweft is a styling station for your hair extensions that makes them a breeze to wash, style and look after. You mount the station on your wall using an adhesive pad (or you can drill it in if you prefwer - wall fixings are supplied), and it gives you somewhere to dry, style and store your hair extensions, saving time, hassle and mess! For me, I have a little ensuite bathroom in my bedroom that is the perfect place to keep the station. Washing your extensions depends on the type of hair they are. If they’re real hair, you can shampoo and condition just like you would your own hair. If they are synthetic, they’re a bit harder to look after – you have to wash in cold water, using a fabric conditioner – otherwise, they go hopelessly static. Washing synthetic hair can be a challenge because it tangles up so easy. Using the Easilocks styling station helps enormously. Hang them straight and use a metal-pronged brush to comb through, and you’ll be able to avoid them becoming a knotted mess. I actually own and use both types of extensions. Traditionally, real hair has been the better option, but synthetics are improving all the time, and you can now get ones that are able to be heat styled and look much more natural than the old-school super-shiny nylon ones. 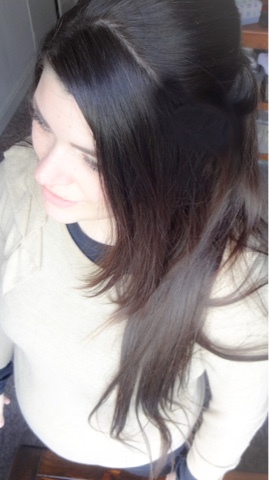 One of my favourite clip-ins is synthetic and it looks great. They can be a little trickier to care for than real hair, but the Easiweft styling station makes this process much smoother. It’s neat, non-bulky and comes in lots of colours, from popping brights to more muted tones that will suit any colour scheme – this is the ‘cashmere’ colour option. When you’ve washed your extensions, you slot them into the Easiweft and comb them through. I like to add some detangling spray, especially if I’m using my non-Remy, synthetic ones. Then use your hair dryer to dry them off (this is a million times easier with them in the holder, or even leave them to air dry). Usually, I’ll pop the extractor fan on in the bathroom and leave them. Curling or straightening them is also much, much easier when they’re docked in the Easiweft, and you can use both hands. I’m freaking awful at styling hair because I hate the whole awkward, reaching around the back of my head bit. This tool makes it so smooth, even I have the patience to style them properly! You can get each section to sit exactly the way you want it to. The whole thing is so simple and so brilliant. In the past, I’ve faffed around with hangers and pegs and god knows what, whereas this saves time and also improves the condition and shelf life of your clip-ins and hairpieces by allowing you to care for them better. Style the hair pieces in the holder, style your own hair to match, clip in the pieces, mist with hairspray and you’re good to go. Having the Easiweft makes me much more likely to use my extensions, because styling and caring for them isn’t such a pain anymore. You have to love inventions that make life easier, less messy and less stressful – and help you get the most of things. Bravo Easiweft – you’ve put a smile on my face, gorgeous locks on my head and saved my bathroom from certain doom. Get yours here.